The new PC-6 is is a beautiful 600 class 100% Scale Aircraft. 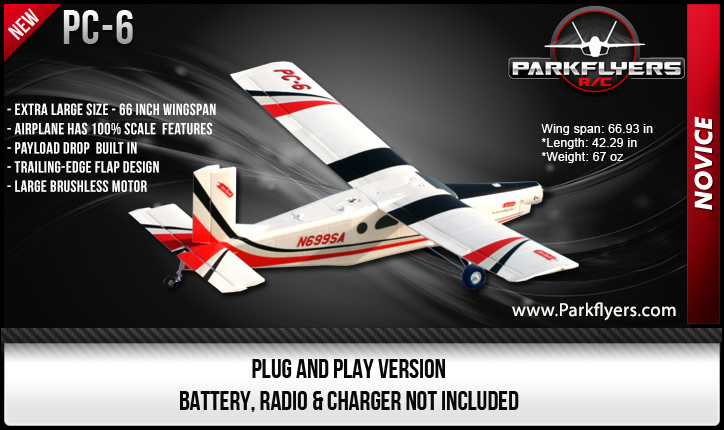 With Its Large 66 inch wingspan, it has superb flight performance that exceeds most aircraft. Features a durable "EPO " foam construction for increased durability as well as rigidity. It features a functioning glider tow hook, and an Air Drop Mechanism for parachutes, leaflets or any type of dropping during flight. The PC-6 will can fly very SLOW as well ! With just 1/4 throttle , you can easily maintain level and controlled flight. Supplied in the popular Plug Play format, the PC-6 includes brushless motor, ESC, servos, working lights, and flaps as standard equipment. Just ADD your own 6 Channel Radio,RX, Battery, & Charger !!! Very smooth and stable in the air ! Flies like a dream. Very stable and forgiving and with its LARGE 66 inch wingspan. This bird has presence ! Features extra large wheels for easy take-offs in tall grass !